Vicki Schull - School of Kinesiology, Univ. of Minn.
Vicki Schull is a Lecturer in sport management in the School of Kinesiology and an affiliated scholar with the Tucker Center for Research on Girls and Women in Sport. 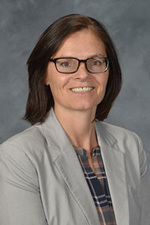 Her research interests include leadership and gender in sport organizations including how organizational and social processes operate to impact women and men in sport leadership positions. Schull worked in college athletics for a total of ten years including a two year stint as Associate Athletic Director and Head Softball Coach at Suffolk University (Boston, MA) where she also served as the department's Senior Woman Administrator (SWA). Prior to moving to Boston, Schull spent eight years at the University of Wisconsin-La Crosse where she served as the Head Softball Coach and Lecturer in Exercise and Sport Science with a focus on sport management. Schull, V. (2017). Young women in sport: Understanding leadership in sport. In L. J. Burton and S. I. Leberman (Eds. ), Women in sport leadership: Research and practice, (pp. 98-115) New York: Routledge. Schull, V. (2016). Female athletes’ conceptions of leadership. In N. M. LaVoi (Ed. ), Women in Sports Coaching, (pp. 126-138) New York: Routledge. Kihl, L. A., Shaw, S., & Schull, V. (2016). Gender politics in US college athletic departments. New York: Palgrave Macmillian. Schull, V., Shaw, S., & Kihl, L. A. (2013). “If a woman came in … she would have been eaten up alive”: Analyzing gendered political processes in the search for an athletic director. Gender & Society, 27(1), 56-81. Kihl, L. A., Shaw, S., & Schull, V. (2013). Fear, anxiety, and loss of control: Analyzing an athletic department merger as a gendered organizational process. The Journal of Sport Management, 27(2), 146-157. Kihl, L. A. & Schull, V. (2011). Leadership and facilitating an intercollegiate athletic department merger. Journal of Issues in Intercollegiate Athletics, 4, 326-353. Kihl, L. A., Leberman, S., & Schull, V. (2010). Stakeholder constructions of leadership in intercollegiate athletics. European Sport Management Quarterly, 10(2), 241-275.